So.... the Doctor(s), Companions, Cybermen, Daleks, the TARDIS herself. Anyone else thinking of Doctor Who costumes? Have you done one in the past? Post about it here! I plan to do two DW costumes this year. My daughter will be 3 this Halloween and I plan to dress her either as a Dalek or the TARDIS. Ah, people who get it will understand. Of course it would be creepier to be one of the people who is in the middle of being transformed and have the gas mask as part of your face, but I want to be able to take it off. So totally awesome. I loved the gas mask look, so creepy. Can't wait to see your pictures and progress! One of these days I plan to sculpt and cast a "The Silence" mask. 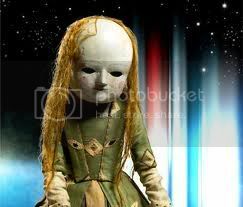 I'd love to see the Peg Dolls from George's cupboard in "night terrors"
We want to play! Mwahahaha!